Make sure you get this FREE e-learning before it expires from Microsoft! Go here and learn about all of the programs in Microsoft Office 2007! Make sure you bookmark this site and keep ahead of the curve - everybody in your company or organization will thank you later because you'll be the go-to person and know more than everyone else! 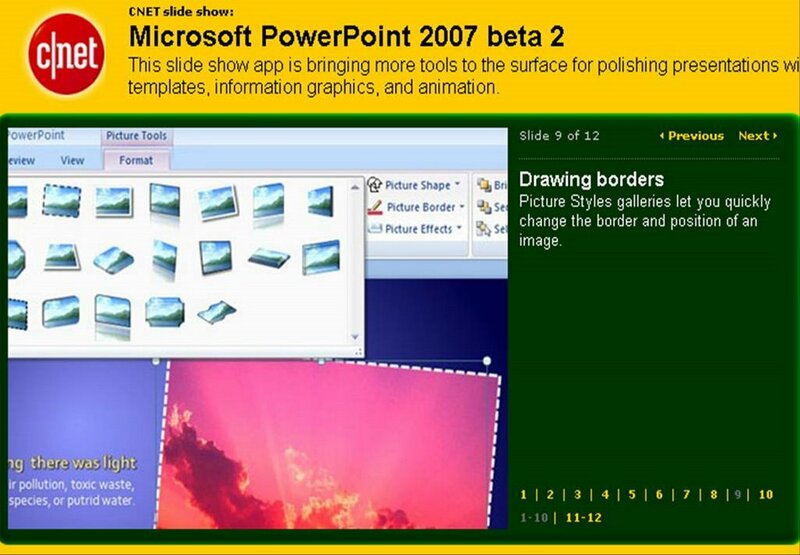 CNET's review of PowerPoint 2007 and functionality. This is a great review by CNET including lots of pictures of the new PowerPoint 2007. FREE PowerPoint 2007 e-course from Microsoft! This online course introduces the new features and functionality in the latest version of Microsoft Office PowerPoint. There have been substantial changes to the user interface in this presentation application, and this course can help you get up-to-speed quickly. This course covers the new features that enable you to create dynamic and engaging presentations using Office PowerPoint, as well as to collaborate with others by sharing your presentation and slide libraries using Microsoft Office SharePoint Server. Life is a Series of Presentations. Practically every time you say or do anything, at home or work, you are making a presentation, whether or not you realize it. Kim Dower, media coach for celebrities, gives advice on how to make presentations that get the results you want. Gregory Mantell has been called one of the best interviewers in America. The Gregory Mantell Show is a weekly 1/2-hour cable TV talk show that airs in LA and New York. The program focuses on experts, the entertainment industry, and health & fitness.